Zak Carr does 53.23 in the Harp RC medium gear 25, full story coming soon. 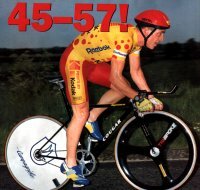 The first and most obvious record to mention is the medium gear 25 mile time trial record. For many years this was held by Tony Doyle with a time of 56-30, but on sunday the 4th of april 1999 Ray Hughes destroyed the record with a time of 55-03 in the Mid Oxon event on the H25/13B, what else can I say. RTTC national 25 mile record. 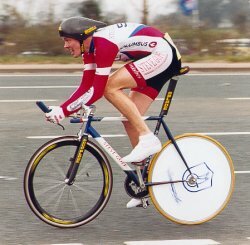 On a wet Saturday evening in 1993, Chris Boardman ( North Wirral Velo-Kodak ) shattered his own 25 mile competition record on 110" fixed. Riding on a revised version of the H25/13 course based on the A34 at Oxford, his plan was simple. Turn the110" gear at 102 rpm and he would do a 47. Chris being on top form during his build up to the hour record attempt looked rock steady and keeping his heart rate at around 180 bpm made the ride look effortless. Choosing a bike with fixed rather than gears resulted in a 30% reduction in weight, Chris was able to stay well on top of the gear and record a 45-57. After the ride Chris said he thought he would be unable to father anymore children after bouncing all over the saddle on the 2 mile downhill start. Personally I would tell Chris to stop moaning and try riding the medium gear. Thanks to Cycling weekly for the picture and info. Isle of Wight 10 and 25 mile records. Kieran Page set the Isle of Wight 10 mile record of 20.08 using 53x15 fixed, he took over a minute off the previous record held by Simon Ambrosini. This record is even more impressive when you consider the Isle of Wight is not known for its fast courses, well worth a 19 on a decent course. He also set the 25 record of 55.16 on the same gear and again taking around a minute off the previous record. Kieran won the national junior 10 with a time of 20.27 again using 53x15 fixed, he was over a minute clear of the second placed rider and set a new course record. Kieran tells me he doesn't know how long these records will stand, he says afterall records are there to be broken. More Isle of Wight records. It seems Kieran was right, in June 2001 he took 15 seconds off his own island 25 record, he again used 53x13 to do his 55.01 in a force 6/7 wind, very impressive. 69 year old Phil Stephenson and 61 year old Dave Goodenough rode the 920 mile end to end in 19 days on a 70 year old tandem trike ( you cant beat a good old un ). The thing I like most about this record is they used a single fixed gear. During the ride they also raised £3,000 for Back Up, the spinal injury charity. Well done lads. Paul Webb from Perth Western Australia told me about the time he was roller racing, using 92" fixed he covered a standing start kilo in just 37 seconds. That is an average speed of 97kmh and a cadence of 220rpm, and just think there was no wind to cool the high friction parts. North East open 10 record. Keith Murray holds the North East of england 10 mile record of 19-57, using 106" fixed. Nik Gardiner, now riding for timetrial.co.uk rode the Didcot Phoenix club 10 on 72" fixed back in 1992 on the H10/11 near Abingdon and Oxford. He recorded a stunning 21.30 which is well over 130rpm average, surely this must be a record. Thanks to Dave Miller for this info. Fastest 10 at 60 ?. At the age of 60 Dave Brown (North Lancs RC) did 21.21 for 10 miles on the L1015 course at Levens Cumbria. He used 102" fixed (54x14), that is an average speed of 28.1mph and 95rpm. Is this the fastest time trial by a 60+ rider on fixed ?. 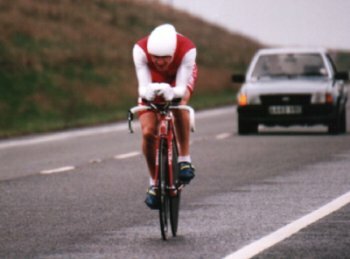 Graham Obree's 10 mile record, also on fixed.